For sure, Haiti will take many lessons from their debut Copa America experience. They were always going to be the underdogs in a tough group – indeed, the fact that Brazil joined them in failing to advance to the knockout stages backs that up. Possibly they could have salvaged a point against Peru – Kervens Belfort will still be having nightmares about that missed header – but they were ultimately outplayed in their latter two fixtures. Even though the current Brazilian squad isn’t vintage, by no means are they short on talent. 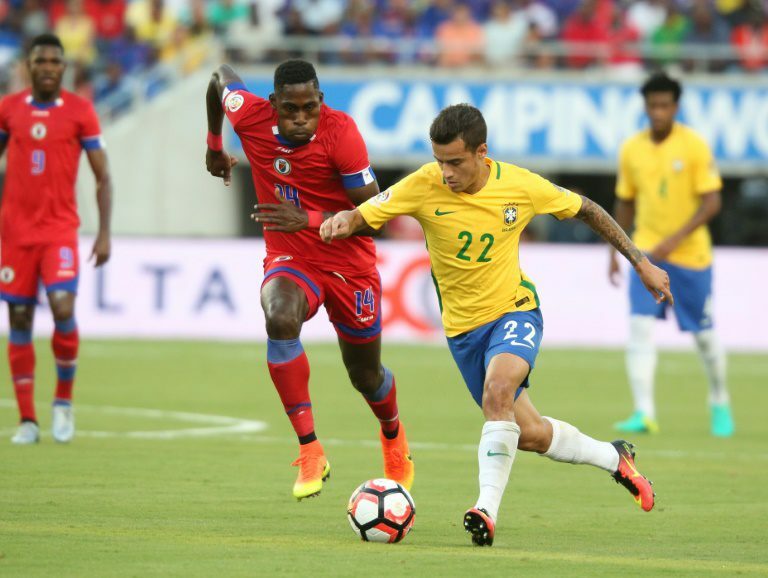 The elusive Philippe Coutinho ran the show, occupying pockets of space where Haiti couldn’t get near him. He registered a hat-trick and demonstrated why he’s such a world-class player. There was something for Haiti to cheer about, though, as James Marcelin became the first Haitian to score past Brazil in three previous attempts spanning over 42 years. Marcelin gobbled up the rebound following some decent build up play by the two substitutes Duckens Nazon and Max Hilaire, who took the initial shot inside the box. The high defensive line that Neveu used against Ecuador was questionable. The full-backs were presented with problem after problem by Antonio Valencia an Jefferson Montero. Centre-backs Romain Genevois and Mechack Jerome are no slouches but they were horribly exposed by Enner Valencia and Jaime Ayovi, both superior in speed and agility. The latter pair took full advantage of the space left in behind to score Ecuador’s opening two goals inside 20 minutes. Haiti never recovered, going onto lose 4-0. It’s a shame that we didn’t really see the effect that Haiti’s wide players can have. Jeff Louis is arguably the team’s most creative player and he showed flashes of his ability vs Peru – curling in the cross for Belfort at the very end. But he was frequently fouled or doubled up on throughout that game. Wilde-Donald Guerrier is just as talented but from a personal perspective, he will not look back on the Copa 100 fondly. He was virtually anonymous vs Peru and then didn’t feature at all after that. Jean Sony and Sony Norde looked useful in the appearances that they made, while Jean-Eudes Maurice flattered to deceive. A positive to come out of the tournament is the emergence of Kevin Lafrance as a central midfielder. Typically a central defender, the 26-year-old started all three matches higher up the field and looked at home: comfortable (sometimes too comfortable) in possession and a constant option for his defenders to pass to. Lafrance plays his club football in Poland’s second division but on the evidence of his Copa 100 displays, he could well perform in a higher European league. I would like to see a three-man midfield involving Lafrance, Marcelin and Soni Mustivar at some point within the near future. Not a huge admirer of Hilaire, playing amateur football in France, over somebody such as Mustivar, playing MLS first-team football on a weekly basis. Perhaps Neveu knows something that we don’t. So what next? The nation’s 2018 World Cup qualifying campaign is practically over. The FA should really be preparing for the 2017 Caribbean Cup qualifiers set to happen in October. Haiti will be favourites to top their group and advance to the Gold Cup. It could be argued that luck was simply not on Jamaica’s side at this tournament. Their performances were reasonably good – ignoring the Uruguay game – but the statistics don’t lie: last place, zero goals and six conceded. So what went wrong? The team’s inability to score has been well-documented – indeed, it was something which I picked up on when previewing their chances at the Copa 100. In six Copa America matches altogether, they’ve not been able to register a single goal. It’s not that Jamaica are struggling to create, more the fact that they’re struggling to finish. Inefficiency and wastefulness have crippled them badly. They carried an attacking threat against Venezuela despite being down to 10 men, while it will forever remain a mystery as to how they didn’t score at least once against Mexico. Clayton Donaldson could have had a hat-trick in that game, as well as two penalties (one pretty stonewall), while Garath McCleary and Michael Hector were also guilty of spurning golden opportunities. Admittedly the forwards didn’t look as threatening vs Uruguay. Donaldson is receiving criticism for not scoring from some Jamaican supporters. Thing is, he’s more of a target man striker who will work hard, pressurize defenders and bring others into play. Giles Barnes usually operates as a No. 10 so acts more as a provider than out-and-out finisher. Dever Orgill was used off the bench as a left winger and could well replace Jobi McAnuff in that position sooner rather than later. It’s nigh on impossible to judge Allan Ottey at international level due to the lack of game time given to him by Winfried Schafer. Perhaps, then, Jamaica missed the injured Darren Mattocks whose goals played an influential part in the country’s 2014 Caribbean Cup victory and advancement to last year’s Gold Cup final. His international goal-scoring record is relatively impressive, although even he can sometimes fluff his lines at crucial moments. Jamaican fans are crying out for a prolific striker to lead the line – but, as we all know, they are often hard to come by. Taking a wider look at Jamaica’s campaign, it’s very difficult to overlook Rodolph Austin’s straight red card in the group opener. Austin unnecessarily lunged in and caught his opponent on the follow-through, leaving his team to play 70 odd minutes at a numerical disadvantage. Sadly, this upset Jamaica’s balance as Barnes was asked to come deeper, cutting off his access to Donaldson with the pair looking dangerous early on. They still pushed forward and created chances throughout the second half, but how different things would have been if it stayed 11 vs 11. It’s safe to say that Je-Vaughn Watson is not a defender, not with Jamaica anyway. Alvas Powell would probably have played at right-back if he wasn’t sidelined. Watson deputized at right-back in the warm-up friendly win over Chile and Schafer decided to keep him there for the Copa 100, having to move him over to left-back when Kemar Lawrence became unavailable due to injury. Watson struggled at full-back, though, lacking the defensive awareness required to play that role. He was too slow getting out to the crosser for Mexico’s first goal and endured a terrible evening vs Uruguay, scoring an own goal and practically gifting the opposition their third. For me, he’s much more effective in central midfield where he can have more of an input on proceedings. What’s more, I was a little disappointed to see some of the domestic-based players left on the bench. It would have been nice to see the likes of Ottey given a run-out upfront, Andrew Vanzie feature in central midfield or Chevone Marsh make a cameo appearance in behind the striker. In the final 10-15 minutes against Venezuela, Schafer brought on Lee Williamson and Michael Binns – a defender and a midfielder who aren’t exactly going to grab a late equalizer. Ottey or Marsh could have tested a tiring Venezuelan back-line a little bit more. With the Copa 100 over, the focus turns to 2018 World Cup qualifying in September. The Reggae Boyz have two huge games lined up: Panama away and Haiti at home. Schafer will know that the pressure on him is building – his players really must beat Panama if they are to stand any chance of making the Hex. The team must, however, address its goal-scoring issues between now and then.